Lilabelle Lane: Am I your OASS Partner? Am I your OASS Partner? I have had a wonderful weekend sewing for you. With the Autumn theme I knew just what I wanted to make for you. Would you like a new cushion for your couch? 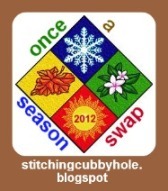 Now, Secret Swap partner, I can not let you know who you are just yet. ooOOH.. such a tease Sharon. Your partner will LoVe the cushion.. why wouldn't she.. it's gorgeous! lol,what a funny post Sharon you are a charactor,lovely gift for that special some-one,lol. A delightful fall tree. I can see why you would want one for yourself too. Sometimes when I make a gift, I plan from the start to make one for myself along with it. Lovely cushion Sharon, you are very clever! I expect to see another one soon for your own couch, lol! !